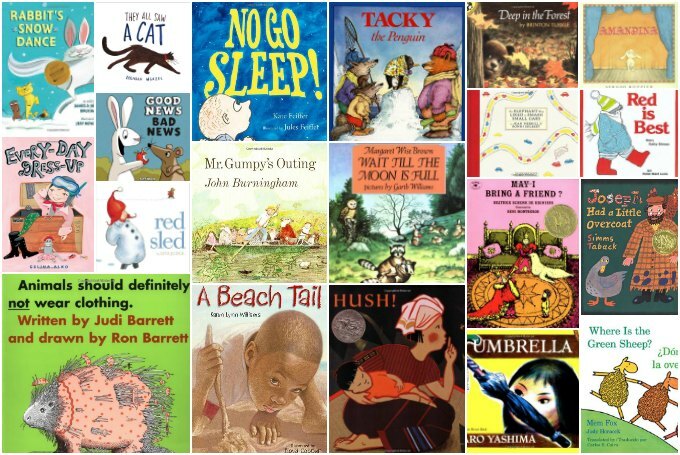 You’ve exhausted all of the other ubiquitous lists of “books to read before you grow up”. You want a comprehensive list of quality books which will appeal to all kids and parents and which go beyond the usual book recommendations. You’ve come to the right book list. First let me say, that making this list of books was HARD. How could I whittle it down to 50 51? I used a couple of criteria. First, if a book was highly likely to be on other “best children’s books” lists I did not include it. No Goodnight Moon, no Where the Wild Things Are. Second, I wanted a list of books that covered a wide range of topics, included diverse faces and illustrative styles. I also wanted to curate classic and contemporary books with a good range of experience—books to make you laugh, sigh, smile and gasp. 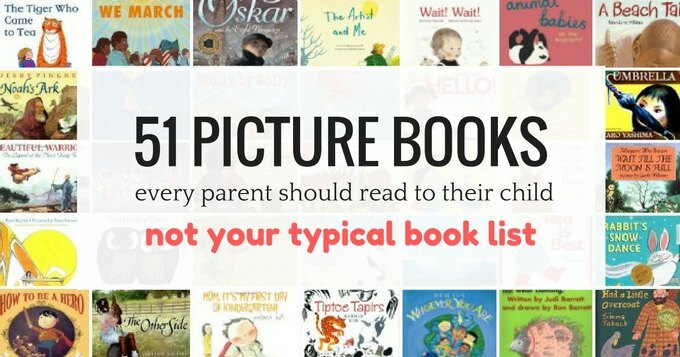 No children’s picture book list can be comprehensive, but I flatter myself that I have a good selection here. 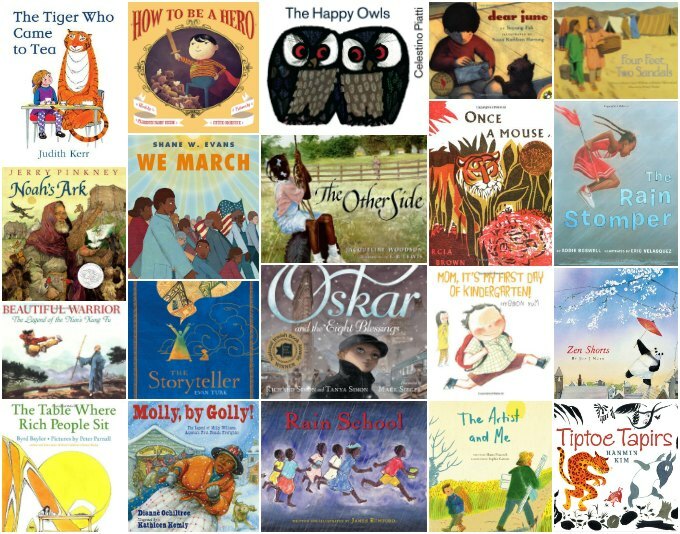 Don’t forget to look for themed picture book lists in the BOOK LIST INDEX! Clive and His Babies by Jessica Spanyol. I adore this board book series about Clive, especially this one in which he wheels around his diverse collection of baby dolls. There Were Ten in the Bed by Annie Kubler. This is a fun interactive book for the classic song in which little hands can literally roll the kids over in bed. My Turn to Learn Numbers by Natalie Marshall. If you are looking for a concepts book, I like this series—there are also books about colors, shapes, etc.—with bright illustrations and tabbed pages. Wait! Wait! by Hatsue Nakawaki, illustrated by Komako Sakai. A sweet book about a baby’s preoccupations with delicate illustrations. Whoever You Are by Mem Fox, illustrated by Leslie Staub. A celebration of all children no matter what they look like and where they live. Breathe by Scott Magoon. A calming book that follows a day in the life of a baby whale. Say Hello! by Rachel Isadora. Walk around a diverse neighborhood and hear “hello” in different languages. My Heart Fills with Happiness by Monique Gray Smith. One of the few board books featuring a Native American protagonist, this book celebrates finding happiness in the everyday events. Is Everyone Ready for Fun? by Jan Thomas. So funny! You get credit for picking any Jan Thomas book to read because once you read the first one, you won’t be able to stop searching out more. Orange Pear Apple Bear by Emily Gravett. A book by one of my favorite authors. There are only 4 words but the creative possibilities are endless. Animal Babies on the Mountain by Julia Groves. A series of board books with bold graphics that names baby animals. Animals Should Definitely Not Wear Clothing by Judi Barrett, illustrated by Ronald Barrett. A humorous look at what happens when animals make the wrong sartorial choices. The Elephant Who Liked to Smash Small Cars by Jean Merrill, illustrated by Ronni Solbert. An elephant with a penchant for smashing learns how to temper his enthusiasm. Red is Best by Kathy Stinson, illustrated by Robin Baird Lewis. A tribute to a child’s obsession with a favorite color. Good News, Bad News by Jeff Mack. The two title phrases are used interchangeably to tell the story of a picnic full of ups and downs. Umbrella by Taro Yashima. Onomatopoeic text accompanies the story of a girl trying out her new umbrella. May I Bring a Friend? by Beatrice de Regniers, illustrated by Beni Montresor. After a king and queen issue an invitation, a boy wants to know if his animal menagerie will also be welcome. Hush! A Thai Lullaby by Minfong Ho, illustrated by Holly Meade. A gentle bedtime story about listening. Where is the Green Sheep? by Mem Fox, illustrated by Judy Horacek. A rhyming tour of humorous and multicolored and multi-talented sheep. A Beach Tail by Karen Williams, illustrated by Floyd Cooper. Take a walk down the beach from a young boy’s perspective. No Go Sleep! by Kate Feiffer, illustrated by Jules Feiffer. Parents everywhere will recognize the protest and eventual surrender of a child who refuses to sleep. Mr Gumpy’s Outing by John Burningham. A joyful book about sharing a boat and sharing a pot of tea. Wait Till the Moon is Full by Margaret Wise Brown, illustrated by Garth Williams. A classic and peaceful tale about how a mother raccoon teaches her son patience. They All Saw A Cat by Brendan Wenzel. Spark a conversation about perspective. Joseph Had a Little Overcoat by Simms Tabak. Die cut pages add to the pleasure of watching Joseph learn how to make something out of nothing. Amandina by Sergio Ruzzier. One of my all time favorite books about a shy dog who puts on a wonderful show. Red Sled by Lita Judge. A child and woodland creatures take a late night ride on the eponymous sled. Everyday Dress Up by Selina Alko. A girl dresses up as contemporary and historical female role models. Rabbit’s Snow Dance by Joseph Bruchac. A delightful Iroquois folktale about how Rabbit lost his tail. Deep in the Forest by Brinton Turkle. A wordless book that will teach kids to think critically as they read a new version of a classic fairy tale. Tacky the Penguin by Helen Lester, illustrated by Lynn Munsinger. A charming story about how being different can save the day. The Storyteller by Evan Turk. Stories nestle within a stories in a captivatingly original folktale. The Happy Owls by Celestino Piatti. With wonderfully dry humor a pair of owls teach barnyard animals the secret of happiness. Tiptoe Tapirs by Hanmin Kim. The tapirs teach the leopard the value of being silent. How to Be a Hero by Florence Parry Heide, illustrated by Chuck Groenink. A wonderfully quirky book about how we perceive heroism. Mom, It’s My First Day of Kindergarten! by Hyewon Yum. A joyful reversal of first day of school anxieties. The Table Where Rich People Sit by Byrd Baylor, illustrated by Peter Parnall. A girl learns how to appreciate what she has and the beauty in the world around her. Zen Shorts by Jon Muth. Stillwater the panda tells the neighborhood children stories which change the way they look at the world. The Tiger Who Came to Tea by Judith Kerr. A girl and her mom hang out at home when one day a tiger with a very large appetite shows up. We March by Shane W. Evans. A gorgeous book depicts the March on Washington with spare, poignant text. The Artist and Me by Shane Peacock, illustrated by Sophie Casson. A wonderful book to both learn Van Gogh, about what it means to be an artist and about bullying. Molly By Golly: The Legend of Molly Williams, America’s First Female Firefighter by Dianne Ochiltree, illustrated by Kathleen Kemly. Learn about how, in 1818, a cook became a hero. The Other Side by Jacqueline Woodson, illustrated by E. B. Lewis. A group of girls cross the fence—literally and figuratively—in the segregated South. Four Feet, Two Sandals by Karen Lynn Williams and Khadra Mohammed, illustrated by Doug Chayka. Two girls in a refugee camp cooperate when they find only one pair of shoes. Dear Juno by Soyung Pak, illustrated by Susan Kathleen Hartung. A young boy waits for a letter from his grandmother, who lives on the other side of the world. Rain School by James Rumford. A celebration of the power of education and the joy of going to school. Oscar and the Eight Blessings by Tanya Simon and Richard Simon, illustrated by Mark Siegel. In 1938 Jewish refugee makes his way up Manhattan on Christmas Eve. Noah’s Ark by Jerry Pinkney. A brilliantly illustrated version of the Bible story that is very much part of our collective consciousness. The Rain Stomper by Boswell Addie, illustrated Eric Velasquez. A rainy day prompts a celebration of joy by a baton twirler waiting for a parade to begin. Once a Mouse by Marcia Brown. A fable about pride, kindness and bravery. Beautiful Warrior: The Legend of the Nun’s Kung Fu. by Emily Arnold McCully. A young girl trains to be a warrior ninja. Can’t wait to read some of these. Lots that I know and lots of new possibilities. Do you have any of these list in an easy, printable format?